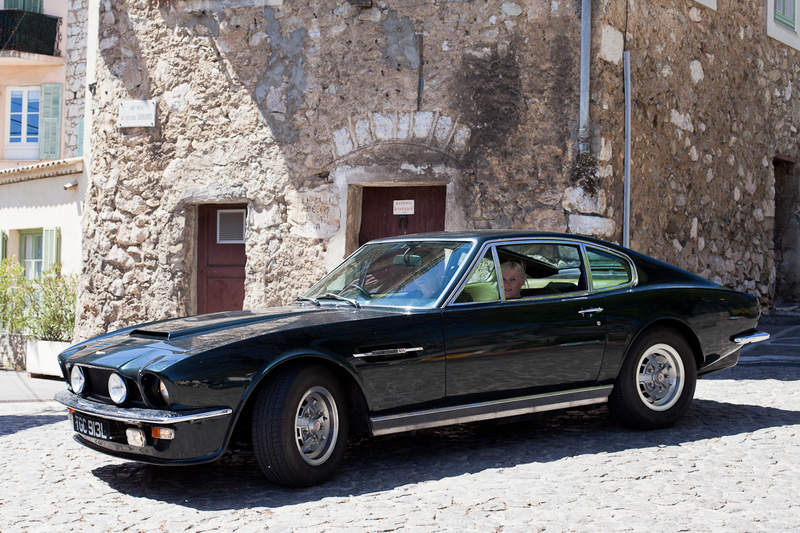 You don't often see an Aston Martin DBS V8 in Gorbio. The young English couple who own her kindly stopped the car so I could take her photo. I forgot to ask her age, but perhaps one shouldn't ask a lady's age. I think she was born/made somewhere between 1969 - 1972. On ne voit pas souvent une Aston Martin DBS V8 à Gorbio. Le jeune couple anglais a eu la gentillesse d'arrêter sa voiture pour que je puisse la prendre en photo. J'ai oublié de demander son âge, mais peut-être ne faut-il pas demander l'âge d'une dame! Je pense qu'elle est née entre 1969 et 1972. (1983 with 'A')O,Q and Z were not used. Then in 2001, it changed again and new numbers were used every 6 months i.e 02 then 52 for 2002 these are prefixed with 2 letters supposedly denoting regions! Now we are in 2012, the numbers are 12 and 62, the 12 covers the period March till august and August till February of the following year! I didn't quite get all of Graeme's comment but I'm glad that someone understands it all. Thanks for sharing, Graeme. Thank you Graeme. I knew the last letter method because was a teen ager and in England they taught me it. But I was ignoring all further details. Thank you so much. Sorry Natalie and Fabrizio, reading it again, I know what you mean!!! What I hope makes it clearer is that the date letter was switched to the beginning of the number plate in 1983 Pre 1983, it was the end letter! Funny you should post about an Aston Martin. Our neighbours in Monaco park their new Aston Martin DB8 in front of our house and they use it to bring their kids to school at 8:15 in the morning. A few days ago I saw her in the parking lot and told her that I knew when she brings her kids to school because I hear her starting their Aston Martin. She apologised for the noise but I told her that I wasn't complaining! Who can complain about the sound of an Aston Martin being started up? Like a lion ripping through silk. Graeme, I posted all this on my Facebook page below the same photo. Many thanks for info. Fabrizio, I remember the Thunderbird. A boyfriend drove me from LA to Las Vegas in one in 1959 I think or maybe a year before or after - can't remember now, but it wasn't pink. I think it was black. Somewhere I've a photo of me standing on top! will you post the image of you standing atop the car?